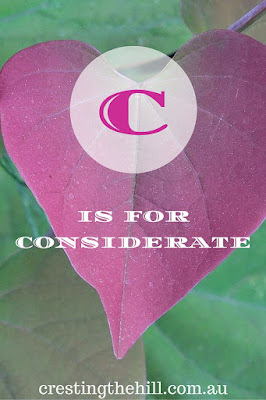 Next letter up for the A-Z challenge of Positive Personality Traits is C - and C is for Considerate. As I head into the second half of life I'm noticing that the more you interact with other people, the more you realize that we are all different. We have all walked different paths through a huge variety of life's experiences to get where we are today. It's so easy to be offended by someone who doesn't see life the same way you do. It's easy to judge them based on your experiences and your world view, without having considered what they may have gone through that has made them the person disagreeing with you or getting up your nose today! Sometimes we need to take a step back and choose to look at things from that other person's perspective. To be considerate of their feelings and to adapt a little to ensure they are comfortable too. Another "C" word is Compromise and that's where being considerate of others really comes into its own. How easy is it to brush someone aside and not bother to find out more because they are annoying? How quickly we come to our own defense if it seems that we are causing grief to another person. How much better would it be to consider their view point and adjust ourselves a little to take it into consideration? To recognize what it is that makes them uncomfortable and to do what we can to ease that tension rather than riding roughshod over it to get our own way. Next time you are being irritated by somebody, stop for a moment and consider their feelings and their history. Perhaps there is a way to draw them alongside and be inclusive of their point of view while still being authentic to your own. Small compromises can often bring about big results. We all want a win/win outcome so lets consider the hearts and minds of those we encounter and try our best to find some middle ground. Next time for the continuation of Positive Personality Traits - D is for Determined. The older I get the more I realize we are all going through something in life. It may not look like it on the outside - we may look all put together - but on the inside we are all dealing with something. As Atticus Finch aptly said, and I paraphrase... we shouldn't judge anyone until we've climbed into their skin and walked around in it. This is one of the things that I look for in my friends. Someone who might see something and understand that they might not understand but being willing to ask and listen. I think we all look for that Farin - an understanding and thoughtful friend is one you hang on tight to! with age being considerate towards others comes more and more.. So true Leanne. It takes us until midlife to realise about compromise and to accept that all is not black and white in the world. We need to be more tolerant of others as we haven't walked in their shoes. 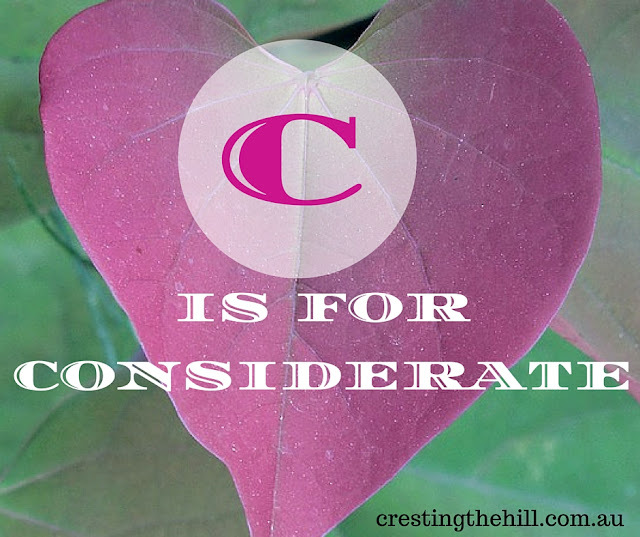 Unfortunately, I'm not sure Consideration is high on the list of many people these days so thank you for the reminder. It's definitely a fading quality in this "me, me, me" world we live in Sue - hopefully as people get older they might slow down long enough to think about how others feel and show a little more consideration. I've been working in Customer Service for over 25 years and the one thing I know for sure is that I don't know what is driving the other person. It could be the worst day of their life and it's up to us to make something go right for them. 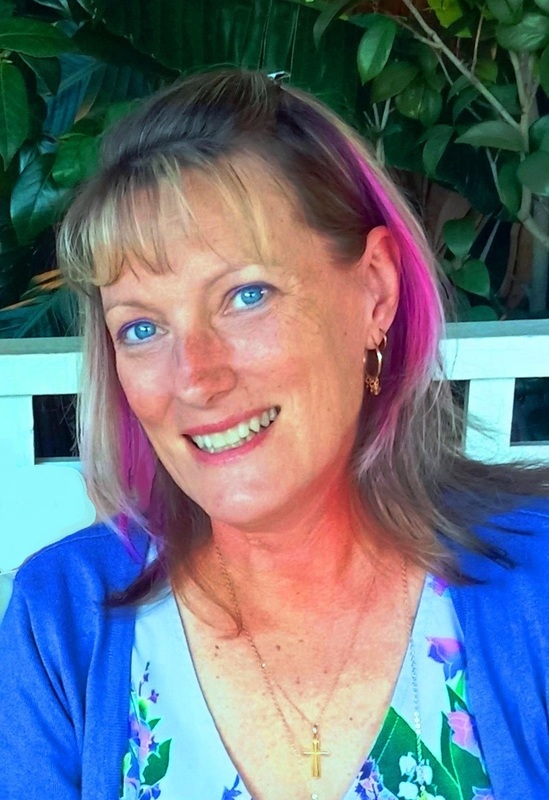 That's so true Jennifer - when you've had a bad day yourself you realize that maybe it would be a good idea to judge others a little less harshly and give them the benefit of the doubt. It makes everyone's life easier. Hey Leanne, this is so true. As we grow older, this aspect carries more and more value. In our fast-paced lives, we have run out of patience for kind gestures and consideration towards the feelings of even those close to us! Lovely post dear! thanks Kala - I think what you say is so true - our world doesn't let us slow down long enough to think of others - we need to make the effort to stop and put ourselves in the other person's shoes. We live in a world in which consideration is often given short shrift. This is such a good reminder to take a breath and be the good person we know we can be. thanks Carol - I think we are all capable of being considerate but some don't want to put themselves out to get there - selfishness is really prevalent today. Well said, Leanne. A little bit of consideration goes a long way in making relationships stronger and more mutually satisfying. And surely, what's the harm in showing a little consideration for a fellow human being? my thoughts exactly Chicky - it doesn't take that much more effort to be kind or considerate and the onflowing effects are wonderful. More consideration across the board would certainly make life more pleasant. I think that's the balance you learn as you get older and wiser Debbie - who to keep and who to let go. Consideration can only go so far and there has to be reciprocation over the long term or it just wears thin. It's a wonderful trait to have Zeljka - but I think it's getting rarer in our world today. Keeping thinking about others - we need as many considerate people as we can get now days! Loving your posts and your theme. I think being considerate is such an important part of everything you do and shouldn't really be something we have to think about - maybe I'm just being idealistic. I've found this is one of the traits that can be contagious in a group and family. Love your theme. Thanks Susan - and yes it would be nice to think that being considerate could be contagious - how great would that be! To be considerate, you have to think of others before yourself, which in itself is a rare and beautiful thing. I just found your email subscription hiding in the side bar now I'll never miss another! You should move it up top where you can see it a little better. I just love this series. Everyone has a different take on what the letters should stand for. Thank you so much for linking at #overthemoon! I look forward to seeing what you share very week. Please come back for #WonderfulWednesday. Don't forget to comment your link #'s so I can be sure to visit. Pinned and shared.